Killer Characters: Halloween is coming--will you be ready? Halloween is coming--will you be ready? It's that time of year again for people who love to create with textiles and thread. It's time to make Halloween costumes! In Threadville, we have a craft fair aimed at helping people choose what costumes to make and the materials with which to make them. We'll even have some zombies in town, attending what they're calling a "zombie retreat." They'll be at the craft fair selling--well, I'm not sure what, but it's sure to be interesting. And maybe lifelike. Or is that deathlike? Edna, who owns Buttons and Bows, is getting married the Monday after the craft fair and zombie festivities are over. We're planning a hilarious (we hope) surprise for her. Edna loves everything that sparkles and shines, and we're creating a very dramatic overskirt that she can wear to the reception, if she wants to. We'll be displaying it in the gazebo in the park to help advertise the craft fair. 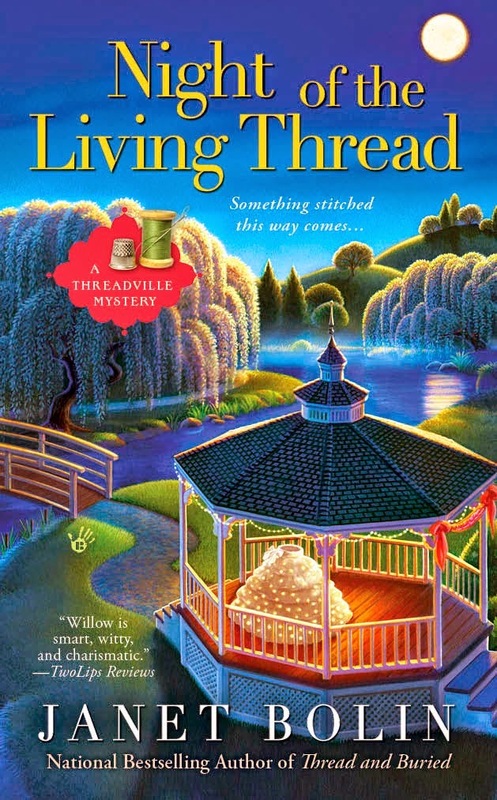 So come to Threadville! What ideas do you have for the best Halloween costumes ever? You can read about how |Willow and her friends follow an undulating trail of glow-in-the-dark thread, unravel ancient Egyptian curses, and creep through a haunted graveyard to unearth a killer in NIGHT OF THE LIVING THREAD, available at these booksellers. Read the first chapter here. Great, spooky first chapter! Love it!!! Great book in a wonderful series. I read it a few weeks ago - terrific! That sounds like a particularly fun craft fair, Willow! Thank you, Linda, but I'm a little worried about those zombies. Even if they're not real, they'll look scary. This is one of my favorite series. I love the Halloween theme in this latest book. Thank you, Annette! Halloween is fun, isn't it! I wish you could find those pictures. The costume sounds wonderful!